PHARR — Bilateral educators gathered here Friday in hopes of fixing a problem facing the entire United States-Mexico border, especially the Rio Grande Valley. While the North American Free Trade Agreement renegotiation stalls between the seventh and eighth negotiating rounds, all while President Donald Trump continues to berate Mexico, the border region has tried to “tell our story.” The only problem is that it hasn’t gained much traction as Trump, and other elected officials, have railed against immigration and the border. 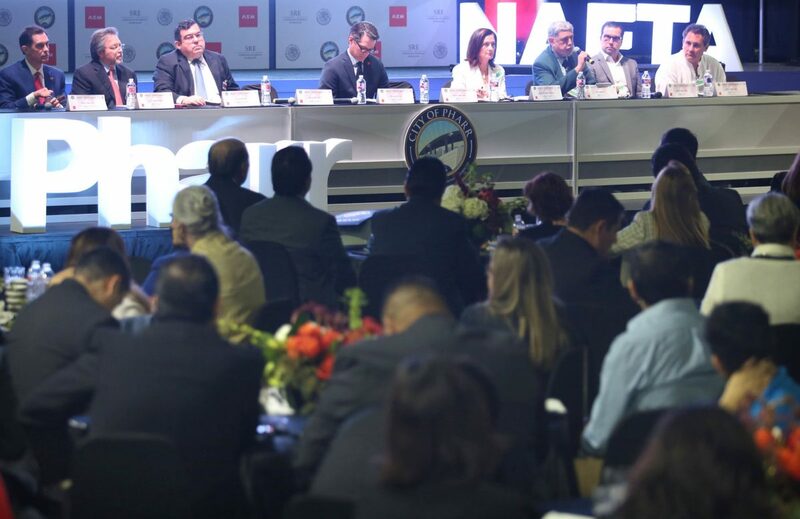 Events such as Friday’s gathering — dubbed the RGV Seminar on the Bilateral Relationship Between Mexico and the United States — at the Pharr Events Center was an attempt to tell that story. 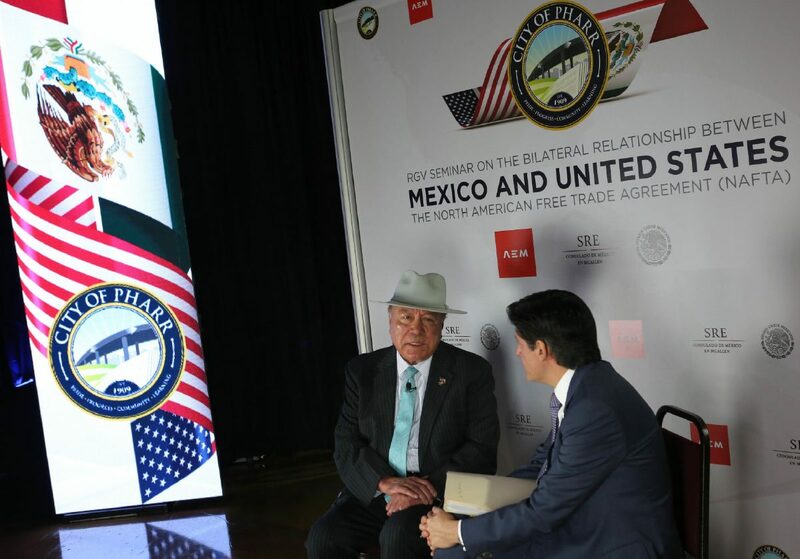 Texas Senator Juan "Chuy" Hinojosa talks with former Mexican Congressman Agustín Gómez during the RGV Seminar on the Bilateral Relationship Between Mexico and the United States Friday, April 6, 2018, in Pharr. Pharr, a city of no more than 80,000 people, may not be a metropolis, but in the U.S.-Mexico relationship, it’s vital, panelists said. The Pharr-Reynosa International Bridge is the top produce port of entry in the U.S. and one the busiest legal entry points on the border. Everyone involved in the event co-signed a declaration explaining the importance NAFTA will continue to have on the Valley and Texas. “Since the treaty was signed, exports from Texas to Mexico have increased substantially,” Barrios Gómez said, reading the declaration. “With exports to Mexico accounting for 40 percent of the annual exports from Texas,” and in 2017, the trade exchange between Mexico and Texas totaled $187 billion. Barrios Gómez added that annual trade between Texas and Mexico exceeds annual trade between all of the other Latin American countries with the world. Caroline Mays, who works with freight and international trade for the Texas Department of Transportation, explained how trucks are the dominant mode of transportation for the trade between the two countries. Just measuring trucks, $67.9 billion flows from Mexico to Texas, Mays said. Salvador Contreras, who oversees the University of Texas Rio Grande Valley Center for Border Economic Studies, briefed the room on NAFTA happenings. Though this could all change in the coming weeks as the Trump administration may push for an agreement in principle with Canada and Mexico, especially as the president plans to attend the Summit of the Americas on April 13 in Peru. But reports over the weekend indicated that it’s unlikely. Contreras said that a so-called sunset clause has been discussed, which would mean the pact would have to be renegotiated after a set amount of years, likely five. He also explained how the U.S. is pushing for higher rules of origin for NAFTA-produced products, especially related to automotive parts. Regional rules of origin are currently at 62.5 percent, meaning that in order for a product to qualify under NAFTA, 62.5 percent of it must be produced from the three countries. The U.S. has proposed increasing that number to 85 percent, Contreras said, with 50 percent of that to be from the U.S. Canada and Mexico have not showed much interest in accepting this proposal. While the uncertainty on NAFTA and relations between the two countries continue to grow, the panelists on Friday explained why it’s so important for them to get along.